Located far north in the Mergui archipelago and just 4 miles east of West Canister, you will not be surrounded by other divers at Freak Island. Like many Mergui dive sites this area is little visited and pristine. Freak Island is a dive site for seeing smaller critters and is great for macro photographers. It’s a relaxing dive with good visibility and generally weak currents. Freak Island makes a good day or night dive. The small tree covered island descends 30m below the surface and the rocks are carpeted with sea fans, feather stars, soft corals, hard corals and anemones. 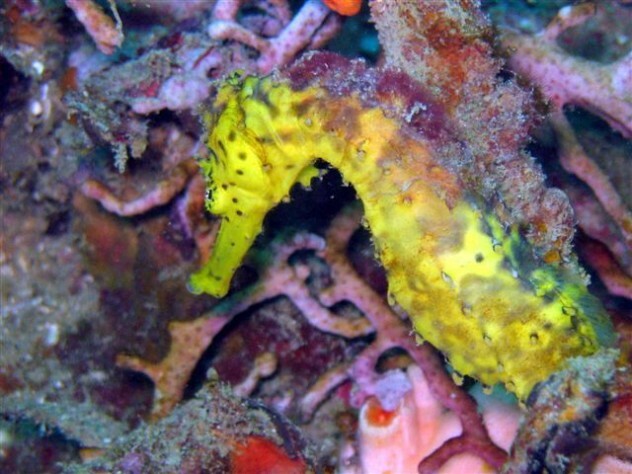 More unusual marine life includes ornate ghost pipefish, harlequin shrimps, angler fish, yellow tigertail seahorse and stonefish. Various species of moray eel including fimbriated, giant and white-eyed are common as are scorpionfish and lionfish. Sweetlips, pufferfish, parrotfish and triggerfish are numerous. Octopus can often be seen hiding on the reef.